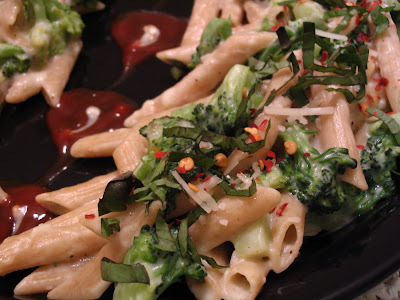 Here I have used whole wheat pasta which is more nutritious than enriched white flour pasta. Another ingredient is broccoli whis is very nutritious contains huge amount of vitamin c, folate everything. 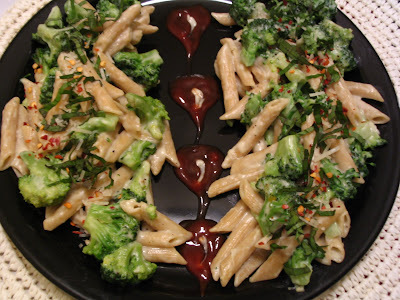 This is similar to mac and cheese recipe since I had broccoli in my fridge I just added with pasta which tasted so good everyone loved it. So this is how I made. Basil, Red chilli flakes, parmesan cheese for garnishing. 1. Bring water in pot for boiling pasta season with salt and cook pasta. 2. Blanch broccoli in hot water, remove it and drain. 3. For making white sauce, heat butter and olive oil in the frying pan once the butter is melted. 5. Add the chopped garlic and saute for few seconds. 5. Add the flour and mix it so that raw smell disappears and color of flour slightly changes. 6. Now pour the milk and whisk immediately well to avoid lumps. 7. Cook for some time by adding salt, nutmeg, herbs and Pepper. 8. When it starts thickening add cheddar cheese and let it cook for some time , stir it constantly. 9. Now to this add the cooked pasta and broccoli mix well and garnish with red chilli flakes, basil and parmesan cheese. 10. Kids will sure love it offcourse we too....Enjoy. 1. Since we areusing more cheese I reduced the amout of butter in making white sauce and added olive oil. 3. Instead of broccoli we can use green peas too. yummy yummy pasta..my hubby fav!! penne is our favourite too...!! Both healthy and yummy, I guess...best way to eat broccoli. I even liked ur manchurian...very colorful. So tasty and looks great!~ U have a very nice blog!! This is our fav quick meal.. looks yumm! wow those pictures look so gorgeous....i kept staring at them for sometime! 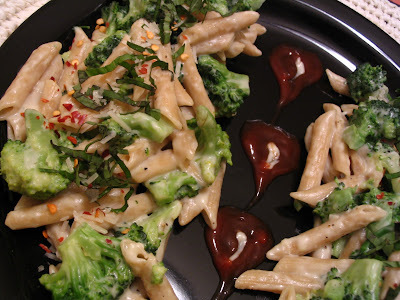 Pavithra, this is also now on my 'To Try' lists!My daughter (4yrs) loves brocolli, so this is surely a hit wt her n us! Hey loved the sauce-hearts piped by you, the food styling is awesome!